Interfaith Art Exhibit is a mutual project of the Islamic Cultural Center of Northern California (ICCNC), Kehilla Community Synagogue, and Montclair Presbyterian Church (the three institutions make up the “Faith Trio” ) in Oakland, California. Other major partner organizations of this program are Ziya Art Center, Silkworm Media, and Islamic Art Exhibit. Copyright © All Rights Reserved - Photos of the exhibition used on this website were taken by Lea Delson, Alex Madonik, Raeshma Razvi, and Arash Shirinbab; Photos of the artworks were taken and submitted by the artists and by photographer Dana Davis and Minoosh Zomorodinia. All other materials of this website belongs to the Interfaith Art Exhibition program at ICCNC and Faith Trio organizations. All images of the artworks presented in this website are the ones that were included in the Interfaith Art Exhibitions and the details including the artist, medium, and size are included in the exhibition’s page. Get Social & Spread the Word! Please help us spread the word through social media especially Facebook. 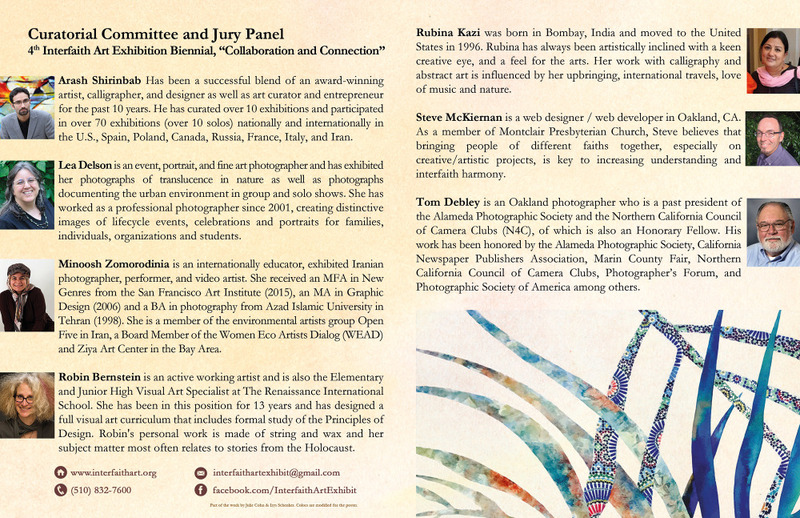 Tell your friends, artists, and art lovers to join this interfaith conversation! There are many ways you can get involved and support us including becoming a volunteer, making a donation, and becoming a partner or sponsor of the program. Please visit the GET INVOLVED page for details.